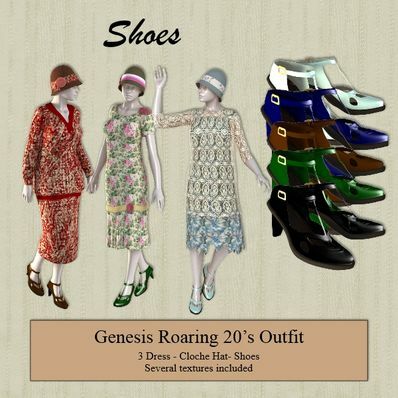 Roaring 20s style shoes for Genesis for use in Daz Studio 4.6. Several textures included. I cannot guarantee that the shoes will work on all shapes. There may be some distortion, but I have included them, raher than leave them out altogether. Another fantastic set of clothing...thank you for sharing. i am working now at club birdland your poser as Roaring 20's party location for your great stuff! missing some more male stuff for this, hats, braces, bow-tie and so on. Thank you so much for sharing all these amazing clothing!!! Thanks for all these roaring 20s outfits 1-4!! GREAT work. Outstanding! As i said before ! Thanks again! It will help me a lot for my studies! Wow! Thank you for the shoes, hat and great outfit.